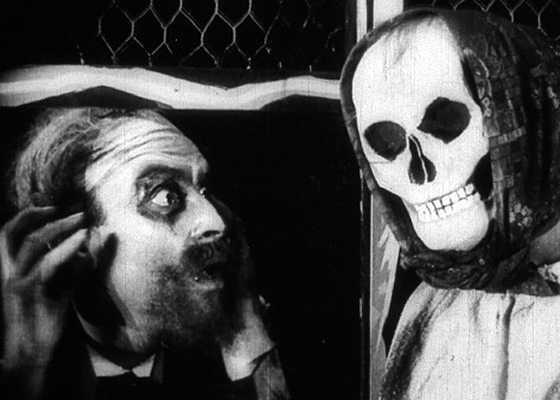 Lotte Eisner’s groundbreaking history of cinema The Haunted Screen (1952) had the unintended effect of popularizing the idea of expressionism—suddenly every Weimar title was considered an example of German Expressionism. Eisner set out to redress that misreading and in 1958, she declared that there were no more than three genuinely expressionist films: The Cabinet of Dr. Caligari, Waxworks, and From Morn to Midnight. With its painted sets, distorted perspectives, and artificial acting, Morn is quintessentially expressionist in style. The story is of a small-town bank teller who, after becoming bewitched by a glamorous customer, decides his own life is paltry, steals a large sum of money from his bank, and flees to the big city to pursue fulfillment. Produced a few months after Caligari’s release, the film had a negligible release in Germany but it found success in Japan in 1922. The film was considered lost for many years but in one of those wonders of cinema history, a copy was found at the National Film Center, Tokyo (now the National Film Archive of Japan) in 1959. Our print from NFAJ is from the 2004 restoration with the Munich Filmmuseum.